While there are numerous official and unofficial names for various Google updates such as Panda, Penguin, Hummingbird etc, this update has been nicknamed the Medic update. This is because there seems to be a focus on health, medical sites and YMYL Your Money Your Life sites. Sites that can demonstrate good E-A-T and quality should be boosted. The common feature of these websites is pages that can have an impact on your current or future well-being (physical, financial, safety, etc.). Google has recognised that the information in this type of website is crucial to the well-being of the visitor. If someone on a health website claims that say Tumeric can cure various ailments, can they back this up with evidence? If a financial website offers advice, is the author respected, has experience of their topic and is offering sound advice? These are questions that Google is attempting to address in the Medic update by ensuring credible, quality websites and pages are boosted in the search engine rankings. If your website offers advice as many do, it’s an opportunity to get ahead of low quality, infrequently updated or inaccurate websites. At the time of writing it’s a 164 page document that Google issues to help its human search quality raters. Google contracts with over 100,000 search quality raters worldwide to evaluate its search results. Raters are given actual searches to conduct, drawn from real searches that happen on Google. They then rate the quality of pages that appear in the top results — hence the “quality rater” name. Quality raters cannot alter Google’s results directly. A rater marking a listing as low quality will not cause that particular page to be banned or lose ranking. However it can lead to algorithm changes if high ranking sites are assessed as low quality or irrelevant by Search Quality Raters. Renowned Canadian SEO consultant Maria Haynes is a big advocate of SEOs, webmasters and website owners becoming familiar with these guidelines. almost everything in Google’s algorithms today ties back to something in these Quality Raters’ Guidelines. And so Google is is one by one is closing these loopholes. 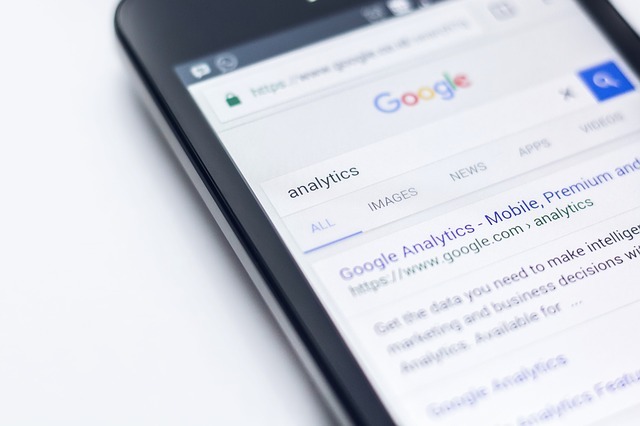 If you’ve found ways to trick Google into thinking that you’re the best site these things are not working so well now and truly you need to actually be the best site and the most trustworthy site for people. So understanding what’s in these guidelines is super important. The document itself is well worth a read for anyone serious about promoting or developing websites. It’s not particularly technical and is very well written. Here is an example of the actual search quality rating examples. Websites are rated for how well they match a particular search. 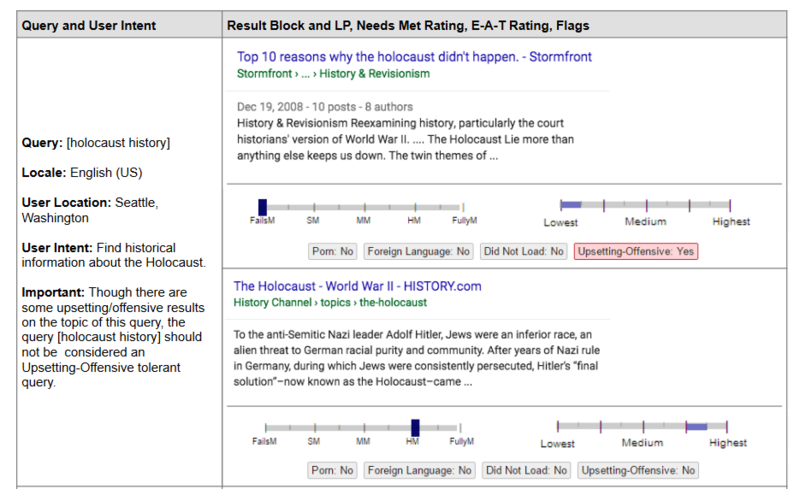 In this case the query ‘holocaust history’ matched two websites, one from a Neo-Nazi Holocaust denial website, another from the History Channel. Before tweaks to algorithm Google would show both sites high in search results even though the Neo-Nazi was misinformation and lies. The intervention of human search quality raters should have picked this up. However in this case Google were exposed by excellent campaigning journalist Carole Cadwallader for showing holocaust denial websites at the top of search engine rankings when the search intent was likely to be very different. 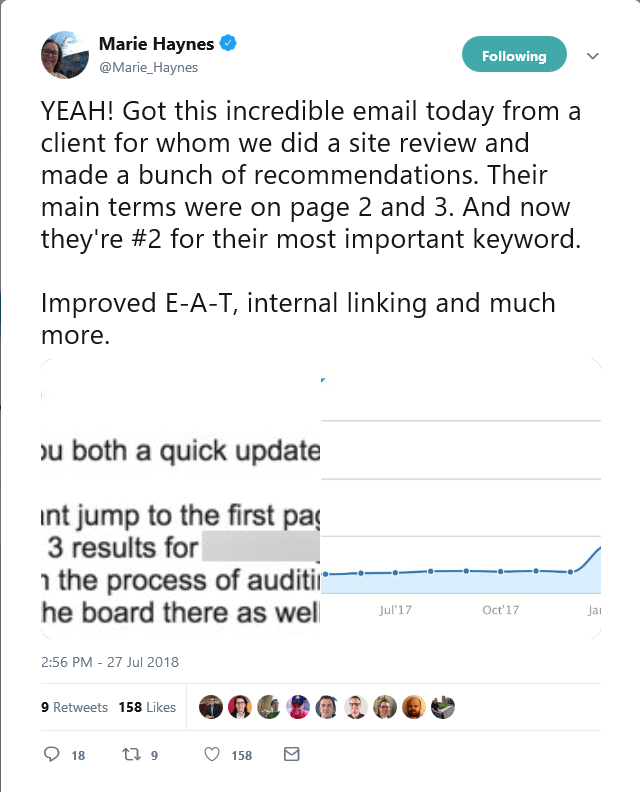 As we have said before, improving E-A-T ratings is something you need to bear in mind when you are planning your website content and making improvements. Your website visitors – always and forever. Search engine bots – those programs that index your content for search engines. Search quality raters – they are always testing searches and relevancy. Search Engines – if they link to your website will their users get a good experience? Include Author Names & Biographies for All Editorial Content – information about the author needs to be available in order to evaluate whether they are a suitable expert for the topic at hand. Improve your personal brand – in the age of fake news and pseudo-experts make sure you tell your story and prove that you and your authors know what they are talking about such as being open about qualifications and direct experience of the subject matter. Cut or reduce low E-A-T content – be ruthless and get rid of outdated or poor quality content. Make sure your website is credible and improve technical security – consider moving to https even if you don’t handle sensitive personal information. Also ensure your website is upgraded to the latest CMS version as well as plugins or extensions etc. Edit user generated content – apply stricter rules on moderation of comments, forums, reviews and other generated content. Ensure anyone commenting is registered and approved before they are allowed to add content. This latest update is aimed at weeding out spam websites and other poor quality content and is designed to make the web more useful for everyone. By ensuring you follow these guidelines you can boost your rankings in search results and web traffic. Maria Haynes reported on recent dramatic imporvements in traffic from improving E-A-T ratings and other SEO tactics such as internal linking. Get in touch with Dinesh on 07941 686113 you need help on web design, web hosting, SEO services, domain names or email marketing.